“Treasury of Nature” title is without doubt the right tributary of the Mrtvica Canyon. 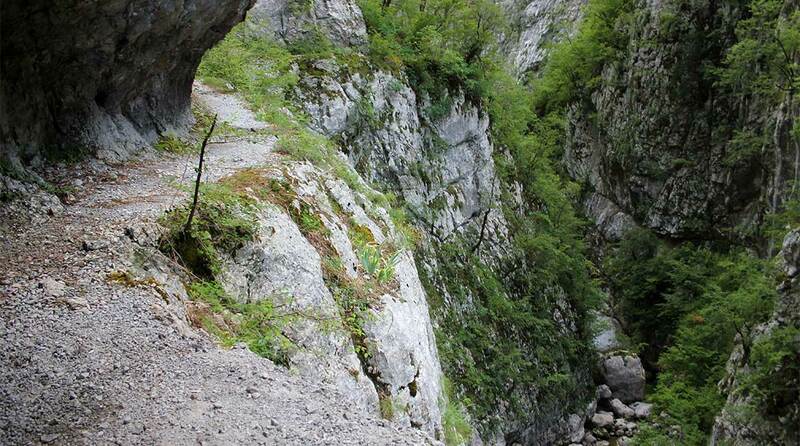 The canyon of the river Mrtvica seems astonishing, almost terrifying in its wild beauty. It is unexplored and unknown partly, for those who enjoy in nature there is marked way. It abounds in vegetation, typical for deep canyon there are remains of ecosystems of the rainforest. It is perplexed with whirlpools (Zvona, Rikavica, famous Bijeli Nerimi, Jame.). Along the river bottom, enormous store blocks with “gigantic cylinders” and “pockets” are scattered, which the river has shaped for millions of years. Green, clear whirlpools, stream falls and play of darkness in the rain forests and luxurious sunlight on the vertical cliffs give unforgettable impressions and feeling of lasting restless eternity. Conjunction of Maganik (2139 m) mountain and magnificent canyon excludes national proportions and belongs to world treasury of nature qualities and values.